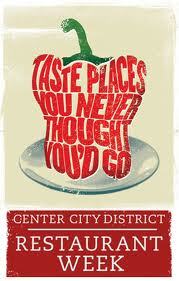 That’s right, the first Center City Restaurant Week(s) of 2012 are Jan. 22 – 27 and Jan. 29 – Feb. 3. These are a wonderful two weeks in which you can eat three-course meals at the best restaurants in Center City at a fraction of the regular price. Many restaurants offer $20 lunch menus and $35 dinner menus. Whether you decide to visit one of you favorite restaurants or to try some place new, here is the list of all participating restaurants. For some, reservations are highly recommended. What I love about these weeks, is that you also have the option of recreating certain dishes in your home! Back in October, I shared the fall version with you and now they have a winter supplement with great new recipes. If you decide to try your hand at any of these recipes, enter the contest to win a dinner for two at Davios! So far, I’m thinking of trying the chilli and the ratatouille (ever since I saw the movie, I’ve wanted to try it).